My excitement was very short lived when the road further ahead was blocked as it was under construction and a de-route had to be taken. This was just the beginning of the horrors that soon followed up. Highway became simple roads, and soon turned to pathetic. 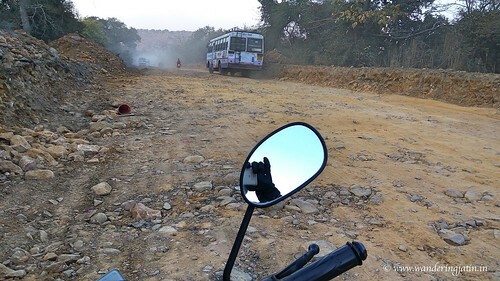 Broken tarmac, unlabelled turns and one lane traffic – not the good signs especially when I had 500 kms in mind. But as always, it was roads which dictated the rules and I merely nodded and took the challenges head on. Long story short, I had only covered less than 200 kms in 5-6 hours! However, I kept at it. I kept riding through those country roads and changing landscapes for the whole day. Keep on the journey, O traveler! Life is a vehicle and time – the wheels. The journey will pass through the river of tears and the garden of happiness, each of which await you. Look around for the melting colors before your eyes. The wind is cool, and so is the shade, I wonder whose village is it which lies ahead! These lyrics of the iconic song Yunhi Chala Chal Rahi kept playing in my eardrums as I rode through! Such bliss! The situation remained bad for the entire day though! 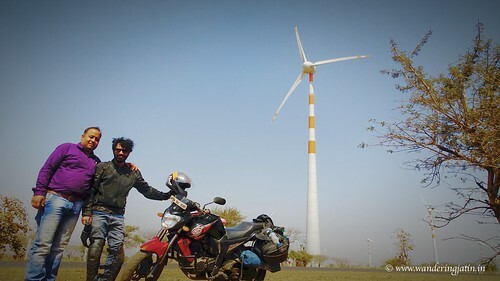 In an extreme test of rider’s patience, I covered ~ 500 kms in almost 14 hours that day! To this day, I stand proud of those numbers and impressed by my own patience at the saddle, haha. 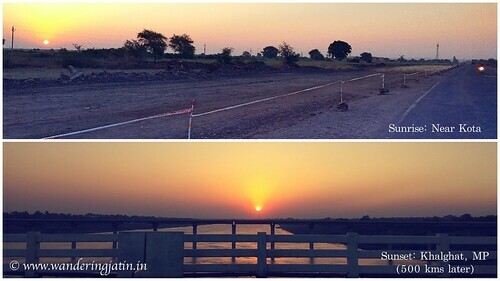 I had seen the Sunrise on the outskirts of Kota, and the Sun was setting down as I reached the bridge over Narmada river at Khalghat in Madhya Pradesh – quite an achievement! 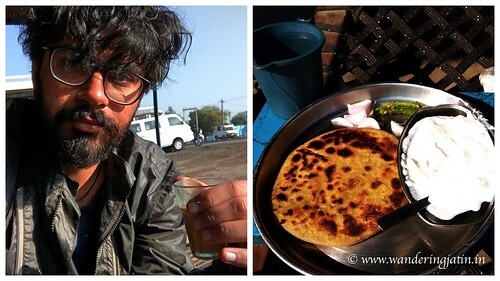 I had taken the Bundi – Kota – Jhalawar – Ujjain – Indore – Khalghat route that day which passed through numerous villages, miles of barren lands and bridges. I remember stopping random vehicles on the highway asking them to take my pictures at the bridge and in the backdrop of windmills. We would strike interesting conversations often and end up taking selfies and stuff, hilarious! A village in District Dhar in Madhya Pradesh where Narmada flows on its banks. Parallel to the bridge built on the highway is an unguarded bridge which the locals use to commute. On both sides of the river are built some temples I went around asking the lodging for, and the response was positive. 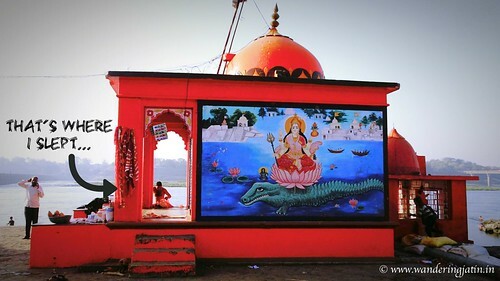 I chose to stay the night in the small veranda of a small temple out in the open right by the Narmada river! Mosquitoes were in abundance and the night was chilly, but my mosquito repellant and the jacket came to my rescue. The padding of my bike jacket became my mattress and I shut my eyes to hear the spooky noises from the crematorium nearby. The local kids had played with my mind about various stories which were now playing in grand detail in my head. But with positive attitude and self confidence, I retired to sleep (after sending my coordinates to my friends, just in case haha!). 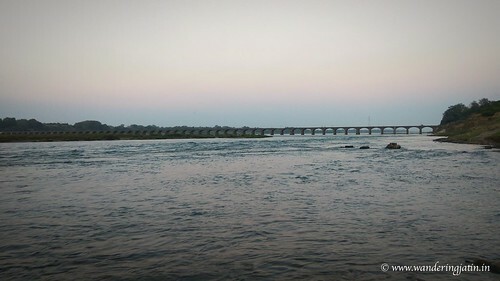 After an uneventful peaceful night, I woke up to the sound of the first devotee around 4.30 am who had come around to pay his dues to the Narmada river. He was shouting “Maa Maa” (mother mother!) and I was trying to shut my ears as best as possible to sleep for some more time. Post that, the devotees kept coming in, and then came the priest who asked me to get up for he had to clean the temple before the puja (prayers). 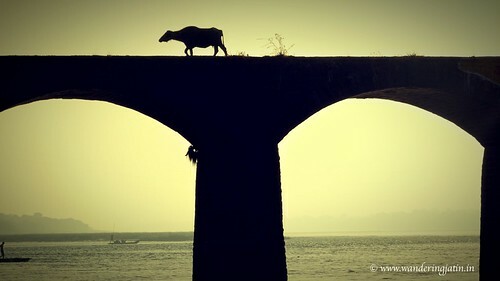 The beauty of Khalghat is a thing to see in the morning! 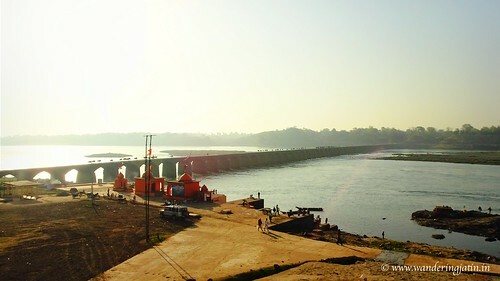 The calm waters of Narmada make a very pleasant sound at the banks and almost the entire village flocks up to the river for the morning bath. I finished off my morning chores behind the bushes and joined the locals for a cool bath in the river. It was an experience beyond words to express when I dipped in the river as the Sun rose up. It is always an out-worldly experience to connect with the basic elements of Nature like the Sun and water which the “modern we” have become oblivious of. 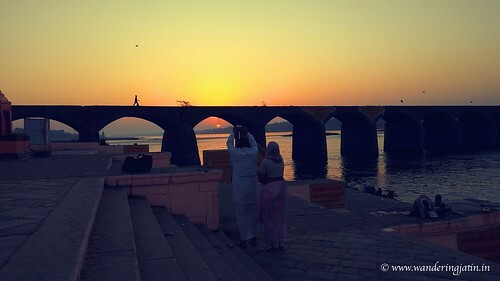 I took my sweet time in walking around, getting ready, interacting with locals, clicking pictures of animals and people moving on the unguarded bridge against the rising Sun (do check out my instagram pictures from Khalghat) and visiting the temples. I witnessed exorcism being carried out by the local priest of a possessed lady with my own eyes. The lady was moving uncontrollably as she was taken to dip in the Narmada and then to the temple. Being an educated individual, I would probably deny a thing like such, but a matter witnessed from my eyes is not easy to refute. 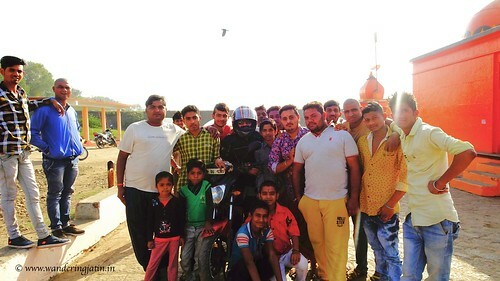 As the Sun grew harsher, the locals had collected in large numbers along with one family out on a tourist trip as well. As I adorned my gears – the jacket, knee pads, balaclava and gloves one after the other, I had started to receive the much unwanted attention. But even that turned out to be fun. A lot many people gathered around me to see me off! They wouldn’t let me leave without taking a thousand pictures and selfies with them – Ah! such love I received! Remember the priest who had woken me up? He was there too in the crowd taking selfies with me! With many best wishes, genuine smiles and a restored faith in strangers and travel, I moved out of the village well aware that I was being tracked with the gaze of many whom I was leaving behind. Have you ever had unexpected awesome experiences on your travels? 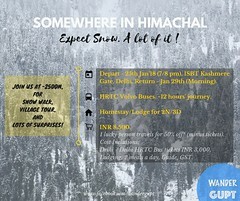 Do share in comments the love of unplanned travel. Note – Please take utmost precautions if you attempt to stay at Khalghat. I would suggest you to stay in the temple on the opposite bank (the priests are very helpful and welcoming), unless you want to spent the night literally at the bank like me. 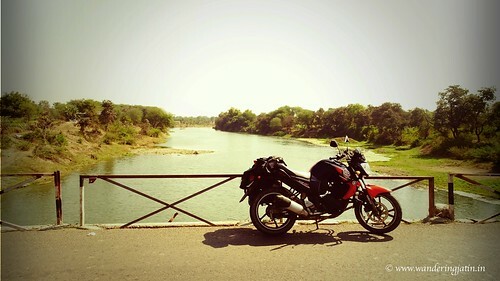 Coming up next – The nearly 600 kms ride to Pune via Aurangabad! Stay tuned.